The 1942 Best Picture nominee, The Pied Piper, opens in Eastern France, shortly after the outbreak of World War II. John Sidney Howard (played by Monty Woolley) is an Englishman on holiday. He says that he just wants to enjoy some fishing before the entire continent of Europe descends into chaos. He knows that France is going to be invaded at some point and he even suspects that the country will probably fall to the Nazis. In his 70s and still mourning the death of his son (who was killed during an air battle over occupied Poland), Mr. Howard just wants to enjoy France one last time. Despite the fact that the bearded Howard bears a resemblance to a thin Santa Claus, he’s quick to declare his dislike of both children and humanity in general. He’s a misanthrope, albeit a rather friendly one. Howard’s plans change when the Nazis invade France sooner than he expected. With his vacation canceled, Howard just wants to get back to England. Complicating matters is that a diplomat named Cavanaugh (Lester Matthews) has asks Howard to take his children, Ronnie (Roddy McDowall) and Sheila (Peggy Ann Garner), back to England with him. Despite his self-declared dislike of children, Howard agrees. However, it turns out that getting out of France won’t be as easy as Howard assumed. After their train gets diverted by the Nazis, Howard, Ronnie ,and Sheila are forced to take a bus. After almost everyone else on the bus is killed in a surprise Nazi attack, Howard and the children are forced to continue on foot and rely on the kindness of a young French woman, Nicole Rougeron (Anne Baxer). Throughout the journey, Howard keeps collecting more and more children. Everyone wants to get their children to a safe place and Howard soon has a small entourage following him. Unfortunately, he also has Gestapo Major Diessen (an excellent Otto Preminger) watching him. How far is Howard willing to go to ensure the safety of the children? The Pied Piper is an interesting film, in that it starts out as something of a comedy but it then gets progressively darker as events unfold. At the beginning of the film, it appears that the whole thing is just going to be Howard getting annoyed with the precocious Ronnie and Sheila. But then that bus is attacked and Howard find himself accompanied by a young boy who has been left in a state of shock by the attack. When the group is joined by a young Jewish child named Pierre, it’s a reminder that, though the film itself may have been shot on an American soundstage, the stakes and the dangers in occupied Europe were all too real. The Pied Piper was nominated for Best Picture of the year. Viewed today, it may seem like an unlikely nominee. It’s a well-made movie and Monty Woolley gives a good performance as John Sidney Howard. It’s the type of film that, due to the sincerity of its anti-Nazi message, should bring tears to the eyes of the most hardened cynic but, at the same time, there’s nothing particularly ground-breaking or aesthetically unique about it. Still, from a historical point of view, it’s not a surprise that this competent but conventional film was nominated. With America having just entered the war, The Pied Piper was a film that captured the national spirit. Other World War II films nominated in 1942 included 49th Parallel, Wake Island, and the eventual winner, Mrs. Miniver. In fact, one could argue that The Pied Piper is almost a cousin to Mrs. Miniver. Both films are not only anti-German but also unapologetically pro-British. Just as Greer Garson did in Mrs. Miniver, Monty Woolley is meant to be less of an individual and more of a stand-in for Britain itself. When both Mrs. Miniver and Mr. Howard refused to surrender in the face of German aggression, these movies were proudly proclaiming that the British would never lose hope or surrender either. Thankfully, the movies were correct. Katie (Mary Steenburgen) is a struggling actress with an out-of-work husband (William Russ) and a deadbeat brother (Mark Malone). Desperately in need of money, Kate goes to an open audition and is immediately hired by Mr. Murray (Roddy McDowall), who explains that Katie will have to meet with one of the film’s investors, the wheelchair-bound Dr. Lewis (Jan Rubes). In the middle of a raging snowstorm, they go to Dr. Lewis’s home and, once they’ve arrived, Katie discovers that she is meant to replace an actress who looked exactly like her but who Dr. Lewis claims had a nervous breakdown. She’s told that she must stay the night so she can meet the director in the morning and when she tries to call her husband to let him know where she is, the line is dead. (For those born after 1996, the line being dead was the 80s equivalent of not being able to get a signal.) Dr. Lewis says it must be due to the storm but he promises to have Mr. Murray take her into town in the morning. Of course, the next morning, the car doesn’t start and it becomes clear that Dr. Lewis is not planning on ever letting Katie leave his home. Dead of Winter is a throw-back to the type of gothic, damsel-in-distress films that actresses like Nina Foch, Ingrid Bergman, and Linda Darnell used to make back in the 1940s and 50s. If you can accept that anyone could ever be as naive as Katie, it’s not that bad of a thriller. Director Arthur Penn fills his movie with homages to Hitchcock and the scene where a drugged Katie wakes up to discover that she’s missing a finger is an effectively nasty shock. By the end of the movie, Mary Steenburgen has played three different characters and she does a good job as all three of them. Jan Rubes makes Dr. Lewis’s too obviously evil but Roddy McDowall is great as the polite but psychotic Mr. Murray. When Mr. Murray sees that Katie has tried to escape by climbing out a window, he yells, “Oh dear!” and only Roddy McDowall could have pulled that off. 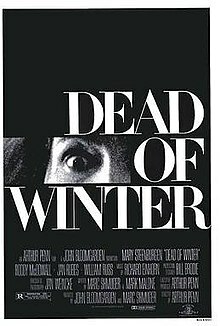 Dead of Winter was Arthur Penn’s second-to-last theatrical film. After making films like Bonnie and Clyde, Little Big Man, and Alice’s Restaurant, Penn’s career went into decline as the American film industry became increasingly centered around blockbusters and Penn’s cerebral approach fell out of favor. After Dead of Winter, Penn would direct Penn & Teller Get Killed before returning to his roots as a television director. Penn ended his long and distinguished career as an executive producer on Law & Order. “I am the future!” Peter Stegman (Timothy Van Patten) announced in the 1982 film, Class of 1984, and, in many ways, he was correct. Though it’s easy to be snarky about the fashion choices made by Stegman’s gang, Class of 1984‘s portrait of a school where teachers have taken to carrying guns to protect themselves is still relevant today. One thing that set Class of 1984 apart from other exploitation films was that it acknowledged something that most people aren’t willing to admit. Sometimes, the worst people can create the most beautiful music. This is a point that was made quite literally in the scene below. As the scene begins, the new music teacher — Andy Norman (Perry King) — is just trying to start his class when suddenly Stegman and his gang decide to drop in. At first, Andy tells them to go away but then, suddenly, Stegman sits down at a piano and starts to play. Timothy Van Patten, who would later go on to become an award-winning television director, reportedly actually played every note heard in this scene. For a few brief seconds, Peter Stegman is revealed to be something more than just another high school psycho. When Stegman sits in front of that piano, he becomes an artist and, throughout the film, both Andy Norman and the audience occasionally wonder who Peter Stegman could have been under different circumstances. Of course, ultimately, it doesn’t matter. Peter Stegman could have been a concert pianist but instead, he went down a different path. Over the course of the film, Stegman is responsible for not only Michael J. Fox getting stabbed but Roddy McDowall getting blown up. When Andy makes one final attempt to reach out to him, Stegman tries to cut his hand off. Now wonder Andy eventually allowed Stegman to plunge through that skylight. But even as Stegman falls to his death and discovers that he’s not the future, it’s hard not to think about that beautiful piece of music that he played just a few days earlier and wonder about what could have been. Who is Johnny Barrows? As played by blaxploitation star Fred Williamson, Johnny Barrows is a former football great who later served in Vietnam and won several silver stars. As a soldier, he killed an untold number of people but he is always quick to explain that he wouldn’t do the same thing as a civilian. Even after the war ended, Johnny remained in the army, teaching new recruits. He was good at his job but, one day, a racist officer decided to play a stupid trick on Johnny. During a training exercise, that officer put a live landmine out on the training grounds. After defusing the mine, Johnny promptly punched the officer. The result? A dishonorable discharge and the lesson that peace is Hell. Johnny returns to Los Angeles and discovers that the country he fought for isn’t willing to fight for him. Because of his dishonorable discharge, Johnny can’t find a good job. Because he can’t find a job, he can’t afford a place to live. Johnny stays on the streets. His only friend is a self-described philosophy professor (Elliott Gould, in an amusing cameo) who teaches Johnny all about soup kitchens. And here’s where we run into a problem with the film’s title. The film is entitled Mean Johnny Barrows but, so far, he’s been almost painfully nice. Then again, Mild Johnny Barrows doesn’t have much of a ring to it. Anyway, Johnny does try to stay out of trouble. He even manages to land a demeaning job cleaning the toilets at a gas station. But his boss (R.G. Armstrong) is a real jerk and Johnny has his dignity, no matter how much the world wants to take it away from him. Finally, Johnny agrees to work with the Racconi Family. Not only does he become friends with Mario but he also falls for Mario’s girlfriend, Nancy (Jenny Sherman). Unfortunately, not all Mafia families are as kind-hearted and generous as the Racconi Family. The Da Vinci family wants to flood Los Angles with drugs. It’s all the master plan of Tony Da Vinci (Roddy McDowall). Tony is eager to prove himself to his father and what better way to do that than to smuggle heroin? Tony also loves flowers because … well, why not? Anyway, when the Racconis object to Tony’s scheme, a mob war erupts. Nearly all of the Racconis are killed. It looks like it’s time for Johnny Barrows to put on his white suit, pick up a gun, and get vengeance for his surrogate family. There are some pretty obvious problems with Mean Johnny Barrows, not the least of which is the casting of Roddy McDowall — perhaps the least Italian actor in the history of cinema — as a ruthless mafioso. After having starred in several successful blaxploitation films, Fred Williamson made his directorial debut with Mean Johnny Barrows. Williamson’s inexperience as director shines through almost every minute of Mean Johnny Barrows. Though he does well with the action scenes, there are other parts of the film where Williamson doesn’t even seem to be sure where he should point the camera. With almost every role miscast, the performances are pretty inconsistent but Williamson gives a good performance (it’s obvious that he understood his strengths and weaknesses as an actor) and Elliott Gould is an entertaining oddity as the Professor. If anything saves the film, it’s that Williamson’s anger at the way America treats its veterans feels sincere. The heart of the film is in the first half, which details Johnny’s struggle to simply survive from one day to the next. Even if Williamson’s direction is often shaky, the film’s rage is so authentic that you do get caught up in Johnny’s story. The film ends on a properly down note, suggesting that, for men like Johnny Barrows, there is no hope to be found in America. To quote the film’s theme song: Peace is Hell. 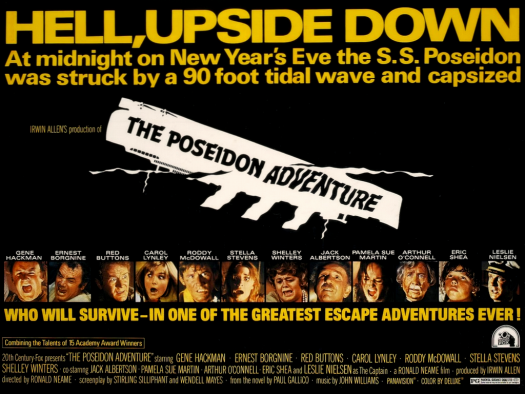 Although 1970’s AIRPORT is generally credited as the first “disaster movie”, it was 1972’s THE POSEIDON ADVENTURE that made the biggest splash for the genre. Producer Irwin Allen loaded up his cast with five- count ’em!- Academy Award winners, including the previous year’s winner Gene Hackman (THE FRENCH CONNECTION ). The special effects laden extravaganza wound up nominated for 9 Oscars, winning 2, and was the second highest grossing film of the year, behind only THE GODFATHER!